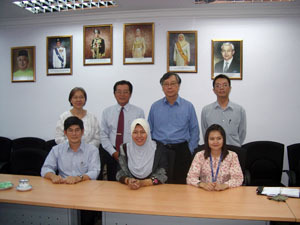 SMA Council Members led by Mr. Lai King Min, the President paid a call on Puan Sabariah Mohd. Sofian, the Director of Ministry of International Trade & Industry (MITI), Sarawak on 19 May 2011, to discuss the issues faced by manufacturers and request the government to solve the problems. Back row, from left: Madam Mariana Ung (Vice-President), Mr. Joseph Lau (Secretary-General), Mr. Peter Chai, Mr. Stephen Ung, Mr. Lai King Min (seated, left) and Puan Sabariah Mohd. Sofian (seated, centre) posed for a photo.